The work triangle is a concept employed by most kitchen designers to make work more efficient in the kitchen and prevent wasted space and movement. As you know, a triangle has three points. In the kitchen work triangle, the points are the fridge/freezer, the kitchen sink and the cooker. When planning the layout for a kitchen, you and our designers will determine the most effective arrangement, reducing your work and making it easier and more enjoyable to prepare meals. In some kitchens, especially where space is limited, two of the three components might lay along the same line. The design concept of an efficient kitchen is more important than it being shaped like a triangle. In addition, when installing a new kitchen, you should also factor in work space on a worktop or an island. If you enjoy preparing meals that take lots of hands-on work, then having convenient workspace in or near the triangle is essential. There are no rules depicting the perfect kitchen work triangle but as a general guideline, the distance between these areas should be no less than 4 feet and no larger than 9 feet. If the distance is too small, it can make a kitchen feel cramped and blocked. If it’s too large, it makes cooking a hassle. 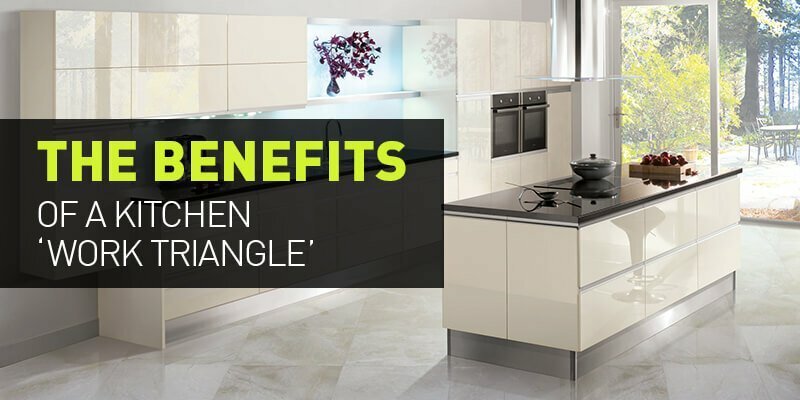 What are the benefits of a Kitchen Work Triangle?